At Security In Shredding we ensure that all data processed by us is confidentially and securely destroyed. Data destruction is vital part of business practice. Data security is paramount to us and the success of a business. Preventative methods to improve your data security comes in many forms. IT security is an area that can overlooked due to newer technologies and people not aware of IT pitfalls. “Phising” What Is It ? 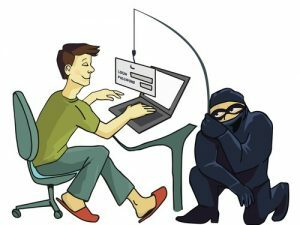 Phishing is still the No 1 cause of data breaches and hackers are getting faster at breaking in, but firms are struggling and usually only find out weeks and even months later they have been breached, according to the 2016 Verizon Data Breach Investigations Report. According to the report, in 93% of cases it took attackers minutes or less to compromise systems.Meanwhile, it took companies weeks or more to discover that an incident had even occurred.Worse, it was typically customers or law enforcement that sounded the alarm and not the organisation’s security measures. According to the report, most reasons for breaches are money-related and cyber-attackers are indiscriminate and motivated by greed rather than revenge or some crusade. Laurance Dine, managing principal in charge of investigative response with Verizon, told Siliconrepublic.com that phishing is still the chief method hackers use to attack organisations. The report found that, in 2016, some 63% of confirmed data breaches involved leveraging weak, default or stolen passwords. Passwords such as “123456” and or “password” are used more often than you think 39% of breaches originate from victims’ own work areas and 34% from employees’ work vehicles. Some 70% of data breaches involving insider misuse took months or years to discover.The report also revealed that new technologies like mobile and the internet of things are providing hackers with more ways of breaching an organisation’s systems.The industries most affected by data breaches are the public sector, healthcare and information. Dine told Siliconrepublic.com that the data information was gathered from more than 67 partners worldwide and involved the analysis of 2,260 confirmed data breaches. “There is still a serious information deficit when it comes to attacks. Attackers are getting into environments in minutes or days and it could be months and years down the line before anyone is aware of it and they usually hear it from law enforcement. This entry was posted in Confidential Shredding, Corporate Social Responsibility, Data Protection, Digital Data, Identity Theft, Product Destruction and tagged Confidential Shredding, Data Privacy, Data Protection, Data Security, document shredding, document shredding limerick, Identity Theft, paper shredding limerick, secure document destruction, Secure Shredding by Security in Shredding. Bookmark the permalink.